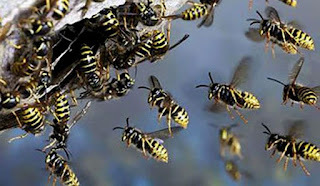 A group of around 20 tourists, including ten foreigners who had visited the Ella, Demodara Aarukku Nawaya bridge around 1.30 pm yesterday (29) had been attacked by wasps and admitted to the Demodara Regional Hospital in serious condition, according to the Ella Police. Around ten foreigners and 12 locals had sustained injuries in the wasp attack and two of the foreign tourists who were in a serious condition had been transferred to the Badulla General Hospital. The tourists were enjoying the sights at the bridge when the wasps in a nest under the bridge had suddenly attacked them. However, the reasons that caused the wasps to get agitated had not been found so far and investigations are being carried out by the Ella Police headed by OIC- CI A.M.M.K. Alagiyawanna.